DIA Certification - Buy with Confidence! The Four C's are a valuable aid in explaining the value of a diamond to a customer. To buy and sell so precious a commodity, you need precise standards of comparison which is where the Four C's come in. The DIA Diamond Certificate will provide you with these important qualities. 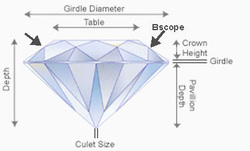 Established in 1996 the DIA Grading Laboratory has all the necessary equipment for making sure your Diamond receives the most accurate call possible.